Jurassic World shows how Hollywood and technology have changed since Jurassic Park. Illustration by Sofya Levina. Images by para/Shutterstock and Everett Historical/Shutterstock. John F. Kennedy famously declared a White House reception filled with Nobel Prize winners to be intellectually comparable to Thomas Jefferson dining alone. 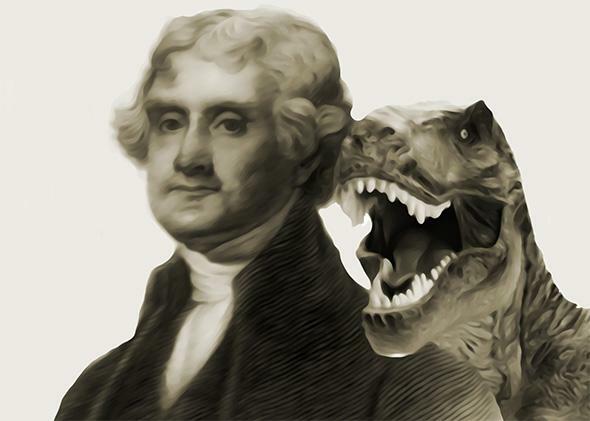 It’s hard to fathom that the erudite omnivore Jefferson knew nothing about dinosaurs. Yet the very word dinosaur would not be coined until a generation after his death. Let’s call this lack of knowledge “Jeffersonian ignorance” (a term for which I take complete credit though an editorialist in Eureka, California’s Humboldt Standard used it differently in 1966). There is no small amount of Jeffersonian ignorance in Jurassic World (and the entire Jurassic Park franchise). From the release of the earliest trailers, critics have assaulted the paleontological flaws in the film (like featherless raptors and other miscreated miscreants). But that criticism misses the point. We don’t hold Jefferson responsible for not knowing what he didn’t know he didn’t know, and based on the box office records shattered, neither did filmgoers find Jurassic World’s dino-sins unforgivable. Since Jurassic Park came out 22 years ago, technological advances have brought about revolutionary evolution in paleontology, filmmaking, and film going, and that evolution is in full bloom in Jurassic World. The three Jurassic Park films (and the two Michael Crichton novels on which they’re based) are fundamentally techno-thrillers, a genre that Crichton himself popularized. Techno-thrillers are heavily reliant on scientific premises that often suffer from built-in obsolescence. Underlying technology that starts out as cutting-edge becomes outmoded, creating a double-edged laser that undercuts the thrills. The original Jurassic Park, released in 1993, is also part of a subgenre that pits man against nature by pitting man-made technology against natural science, specifically paleontology (the science of pits). This doubles the danger of obsolescence, as the very nature of paleontology is about uncovering stuff that undercuts what we know about the very nature of nature. New knowledge overtakes old knowledge, and the thrills are buried by a double-edged shovel. The inherent genius of Crichton’s creation, however, is that it exists in an “alternative tech world.” The stories are not meant to be futuristic, and this gives them an empathy that’s missing from the techno-bombastic Terminator series. The science and technology may sometimes be wrong; Jurassic Park predicted driverless cars and touchscreen computer monitors … operated from CD-ROMs on a Unix platform. But it’s not wrong for the time and place in which it exists—unlike the seismology of San Andreas. So we forgive those mistakes because they follow the most learned path available along their timeline. Ultimately, the timely technology and supernatural science in the series are subsumed to evergreen storytelling. Jurassic Park is just a juiced-up version of Crichton’s own Westworld. The Lost World (Jurassic Park II) is essentially King Kong. The third movie is, well, a mess, but let’s say it’s Land of the Lost. And the recent film is Frankenstein in Godzilla’s clothing. Their stated moral is always some variant on the rock star Darwinian cosmology “Life, uh, finds a way,” but the drama is provoked by a cynical, dystopian ethos in which spectacular technology is subordinated by greed: In the first one, a greedy computer nerd shuts down the park security systems so he can sell embryos; Lost World is driven by the greedy showman who uses high-tech weaponry to bring T. rex to a paying crowd; JPIII is, again, a mess to be ignored; and, in Jurassic World, technogenetics is used by warmongering corporatists to make a mighty dino-weapon—no doubt for money! For filmmakers, Jurassic Park was a watershed production. The dinosaurs were originally meant to be stop-motion spectacles in the great tradition of Ray Harryhausen, but rogue footage of a computer-generated T. rex changed all that. Although only about five minutes of Jurassic Park use CGI effects, the door was opened to a whole new world of whole new worlds, making previously impossible films not only possible but the norm. The film immediately spawned the Star Wars prequels and led to The Matrix trilogy, Avatar, Life of Pi, Gravity, and inevitably, a feast of complaints about how digital filmmaking is heartless and doesn’t look as good as its traditional counterpart. With that in mind, Jurassic World’s director Colin Trevorrow reportedly tried to incorporate a variety of “practical” special effects into the digital mix (e.g., digitally enhanced audio-animatronics and puppeteers in walk-around raptor suits using motion capture techniques). In similar ways, paleontology has experienced advances in technology since the first film. CT scanners use computed tomography to capture and preserve fossilized images, and movement-modeling software has been able to re-create how dinosaurs walked and ran. Endocasting via 3-D printing has led to notable discoveries about their sensory capabilities and cognitive abilities as well. For all that’s been said in criticism of Jurassic Park III, it did feature a scene in which a 3-D printer, called a “rapid prototyper” in the 2001 film, is used to make a raptor skull. Later, that skull generates a noise that scares the attacking creatures away (or something). Cutting-edge technology saved the day from cutting-edge dinosaurs. As for the advances in film-viewing technology since 1993, even infrequent moviegoers must be aware. An opening day screening of Jurassic World in RealD 3D on a five-story Imax screen, with online reserve seats that recline and provide footrests and haptic stimulation (whether you like it or not) cost $22 per ticket. (That’s what I spent for the whole date night in the Jurassic Park age.) Consider that the film can already be preordered for high-def streaming to your device of choice the moment it becomes available, an audience member’s experiencing of technological progress is literally what she makes of it. At several moments during Jurassic World, we glimpse a life-size statue of Jurassic Park creator John Hammond, played in the first two movies by the late Lord Richard Attenborough. With all the pseudo-tech of bringing back long-gone species, it needs to be pointed out that we actually do have the real-tech to bring Attenborough-as-Hammond back to life on film: It brought Fred Astaire back to dance with a vacuum, and it will be on display in the upcoming Terminator Genisys when old and young Arnold Schwarzeneggers meet. What we don’t have is the tech to “bring back” Michael Crichton and re-create his storytelling skills. That level of science, artistry, and sheer intellect would require inviting Jefferson to dinner and a show.